All area dancers are invited to BalletForte auditions. 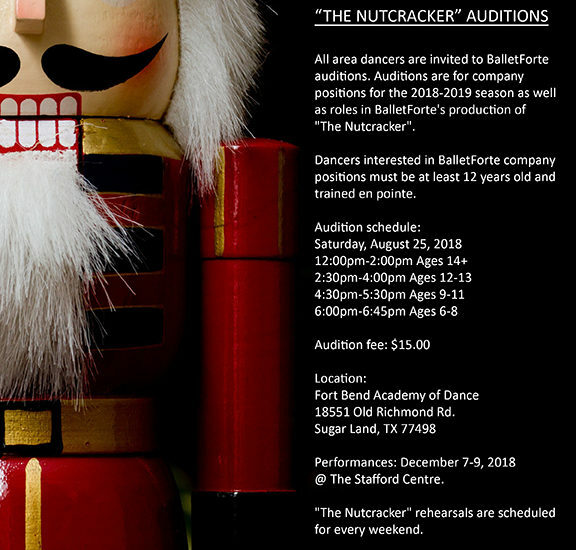 Auditions are for company positions for the 2018-2019 season as well as roles in BalletForte’s production of “The Nutcracker”. Dancers interested in BalletForte company positions must be at least 12 years old and trained en pointe. Performances: December 7-9, 2018 @ The Stafford Centre. “The Nutcracker” rehearsals are scheduled for every weekend. Call 281-799-7554 for more information.